Need to know about killing Ticks in the soil. Is there a safe way to do it? I'm preparing my self-watering veggie containers with home-made potting mix using some of the fertile soil here in Pa. This wonderful soil is full of bugs and I don't want to use an insecticide. Any ideas out there? 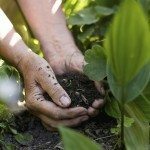 What would happen if I mixed Diatomaceous Earth in the soil? I strongly recommend purchasing a potting soil for your container gardening. The mix is sterilized and will not compact like a top soil or soil from your own yard. This is turn will allow the roots to grow and water to drain well. If your soil is rich and loamy you can sterilize it yourself. Here is also a link with information on how to .